Uraz, U. U., Özmen, B., Pulhan, H., Boğaç, C. (2014). Doctoral Studies On Housing, joint Symposium by HERA-C & HREC, Symposium Proceeding Book. Faculty of Architecture, EMU Press, Famagusta. All rights reserved. Apart from brief reference and citation, this publication may not be reproduced by any means without the prior permission of the publisher. Authors are responsible for the content and language of their respective papers. Dağlı, U., Olgaç Türker, Ö., Faslı, M., Güley, K., Boğaç, C., Uluçay, P.(2007). 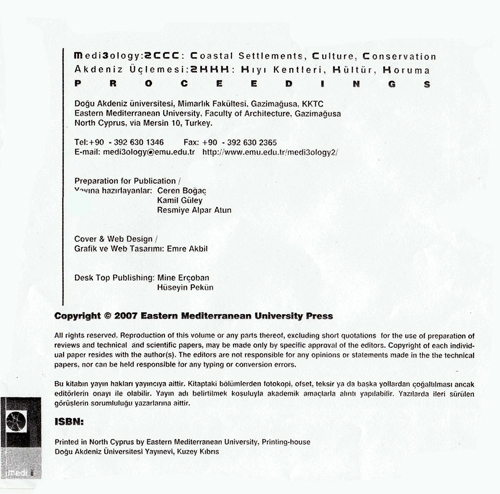 Medi-triology 2, International Gazimağusa Symposium, Symposium Proceeding Book. E.M.U. Faculty of Architecture. Cyprus, an island of exceptional geographical location, has enhanced her milieu by the diversity of civilizations that existed throughout her narrative. Today, this cultural accumulation is reflected on the magnificent architectural heritage of the Island. The bits and pieces gathered by her witnessing memory helped this divided island raise her voice where the years of silence of her northern part was broken via the chain of Gazimagusa Symposiums that started being organized in 1998. 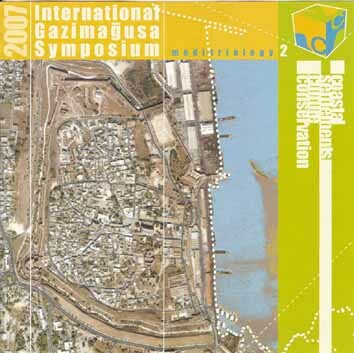 Since then, one of the most important coastal cities of the island, Gazimagusa, has hosted four symposiums organised by the Faculty of Architecture of Eastern Mediterranean University in collaboration with the City’s Municipality.